The fire engineer or driver operator interview is a very stressful event. This is the most comprehensive guide available to prepare you for the interview. Imagine going into your interview full of confidence and without nervousness. The last thing you want to do is throw away all your hard work by bombing the interview. So how can you be properly prepared? Our book is the best kept secret for getting promoted! Our guide has over eighty questions that were used in actual fire engineer and driver operator interviews. You will be able to study them and walk into your interview fully prepared for anything the panel can throw at you. Many of our customers contact us after their interview and tell us that our book covered over 90% of the questions they were asked in their interview. This is a result of our years of work collecting these questions. We have worked with active and retired Fire Chiefs, Deputy Chiefs, Battalion Chiefs, and engineers to create this huge list. We give you the most commonly asked scenarios and SOP / SOG questions. You will be fully prepared for anything the panel can ask. A Comprehensive study system designed to help you formulate and articulate your answers. We have sold many copies of this ebook for $49.97, but during this sale you can get the best preparation system for your fire engineer interview for only $29.97. This is an incredible deal on a book that will prepare you for the most important interview of your fire career. 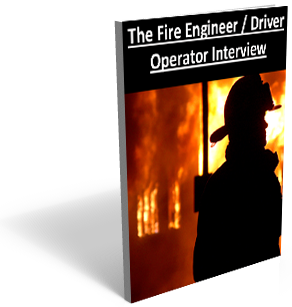 Buy the Fire Engineer Interview ebook now and download instantly. All payments are processed by PayPal, safe and secure.